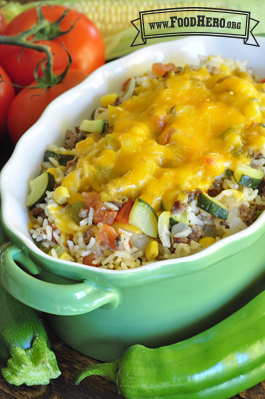 3 Comments for "Mexican Vegetable and Beef Skillet Meal"
I want to share a couple tips for this recipe that I have used in classes with families. Many people do not understand the length of time that it takes to cook brown rice, but will often receive it through a food pantry or their WIC benefits. With this recipe, I go over how to cook brown rice on it's own with the amount of water directed on the rice package. Then we make this recipe, omit the water and add in the cooked brown rice with the vegetables to simmer and soak up the vegetable liquids. We also talk about other ways they could use brown rice if they prepare a larger portion a one time. During the summer we replace the canned, diced tomatoes with fresh. Participants like to add a little garlic powder to this recipe as we prepare it together. This recipe is very well received by adults and children when we make it during class. We usually do a version with meat and a vegetarian version with one can of drained beans; many actually prefer the vegetarian option. We have tried a variety of vegetables in this dish including fresh, canned and frozen and had good success with all. Brown rice is delicious in this recipe, but be aware that simmer time increases to about 50 minutes and extra water is needed.